Classic Car Marketing, Inc. Southern California’s premier marketing company is pleased to introduce this new listing offered for sale by one of our clients. 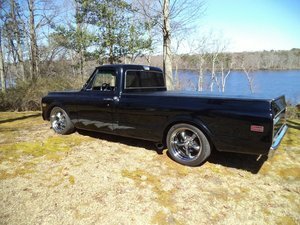 This 1971 Chevy C10 Stepside short bed has just been completely gone through with a 305 V8 rebuilt motor backed by a turbo 350 automatic transmission. Lowered 3 inches gives her just the low look we like and the black paint with red interior is just the right looking combination. Chevy 12 bolt 373 rear end, Eldbrock 4-Barrel 600 CFM electronic choke carburetor, new radiator, new power brakes and drums, new brake cable, new upper and lower control arms, new ball joints, new drag link, new steering components, and a hidden fuel cell under the bed. Inside finds power steering for easy control, a new windshield, new over the shoulder seat belts, new aftermarket under-dash A/C, and upgraded sound system. All this sits atop new American Racing 18 inch wheels on new Nitto tires finishing off this classic truck just right. Offered at $33,000 OBO. For more information please visit our website at www.classiccarmarketing.net or call us at 619-972-7073. Please mention the vehicle you are inquiring about so we can respond promptly. Inspections are encouraged before any purchase, of any vehicle, anywhere.